Quad rotor racing is becoming more and more popular, so it comes as no surprise that Eachine decided to get into the game with a new 250-size racer made for people on a budget. You can easily spend up to a thousand dollars on a nice racer, but if you want to get into the sport for less than 200 bucks, then the Eachine Racer 250 is perfect for you. It’s almost a ready to fly aircraft, but you’ll need to program it and install a receiver before you can fly. Even so, that’s an experience worth having, as it will teach you the basics of setting up a quad rotor and show you that you aren’t alone in this sport. You can set everything up in about an hour or two, but if it’s your first time programming a quad, don’t rush! You want to get it right. 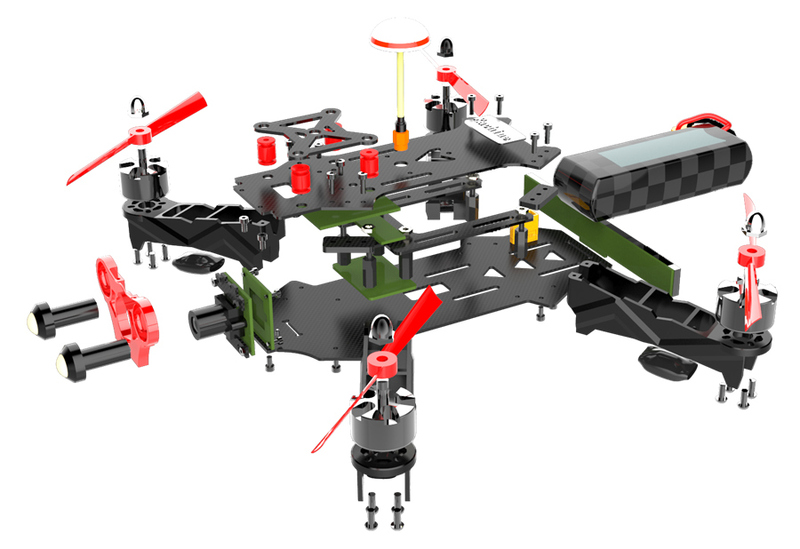 Eachine is a relatively new company to the R/C world. Over the past year, they’ve produced about 10 different aircraft, starting with the X6 hexacopter, one of the first palm-sized hexacopters. They’ve also given us 2 palm-sized quad rotors capable of 3D inverted flight: the 3D-X4 and the H8-3D mini. The latter is an improvement on the former. The X4 was a lot of fun, but the flight controls needed better programming and it wasn’t the most efficient flier. The H8 had a better control scheme during inverted flight and better overall performance, flight time, and design efficiency, showing that Eachine is constantly making improvements. They also gave us the Sky Walker, an amazing little nano quad that can roll on the ceiling and walls. I even turned mine into a Tie Fighter. Now, they’ve produced a nice 250 quad racer for the masses. The ARF version is selling for about $150 and Eachine is advertising an RTF version on their site, but it doesn’t seem to be on sale yet. The Eachine Racer 250 has a built-in snowflake on-screen display that transmits battery voltage, flight time, and channel to whatever 5.8 GHz video receiver you’re using. It also has a very nice first-person view camera mounted to the front of the aircraft with a beautiful wide-angle lens. The body is made of carbon fiber with a few machined aluminum parts, and the rotor arms are hard plastic. It has a built-in mount with shock absorbers for a secondary camera, so you can throw your GoPro on it and record your flights. It also has a cool LED light running across the back that can supposedly change colors, and the headlights are so bright that you’ll have no trouble telling where the aircraft is and which way it’s facing, no matter how far away it is. During my first flight, I noticed that the camera was a little blurry, so I had to adjust the focus. It was pretty easy to do, but it did require removing the camera to reach it. There’s a ring behind the lens that you need to unscrew, and then you can screw the lens in and out to set the focus. When you have it in position, just screw the ring back in until it touches the lens and holds it in place. The quality of the video is decent; it’s advertised as using a 1000TVL HD camera and it looks pretty good on my 800 x 480 video display. The 600 MW 5.8 GHz built-in video transmitter uses a mushroom antenna to transmit the video back to you, which has a great range with very little interference. Speaking of range, I had no issues at all. I was able to fly this racer farther away than I’ve ever flown any other aircraft before. It’s so fast that I could fly it 200 yards away in just a few seconds without worrying about the signal dropping. At about 100 yards, I noticed a little video static here and there, but I was always able to see the image, so it wasn’t a problem. There was also no lag or shake in the video stream. Lights LED. Front, 2, white with lenses. This is a good-looking racer with a big smile… literally. One of the most notable features is the face on the front of the aircraft, which has a set of lights acting as the eyes. It actually has a little smile cut into the aluminum faceplate just below the camera/nose. The smile is a little goofy, but the rest looks great. I might add some teeth to the smile to make it look a bit more intimidating. The mushroom antenna on the top gives the racer a professional look and the long LED strip running down the back will help identify your aircraft within a group, as it supposedly can be changed to one of 9 different colors. The body of the aircraft is made of carbon fiber plates that are screwed together, while the rotor arms are made of plastic. Some people may complain about the rotor arms not being carbon fiber, but honestly, the plastic that is used is very dense and highly crash-resistant. They seem less likely to break in a crash compared to CF arms. The bottom plate of the main body is also an integrated circuit board with a rubber coating. All the parts are designed to be as light and strong as possible, and easy to service. It’s quite a durable aircraft, clearly designed to be flown hard and crashed hard. The rotor blades are the main elements that you could break in a crash; they are designed to shred and absorb some of the impact, so it’s a good thing that the racer comes with a spare set. Unfortunately, the speed controllers are soldered to the main board, so if you need to replace a motor or a speed controller, you’ll need to break out your good old soldering gun. The controllers are easy to access, so it shouldn’t be too difficult to replace them, but when you want to save on weight and overall cost, it’s easier to just solder the motors on, rather than using a plug and play system. When I pulled the racer out of the box, the first thing I noticed was the nice foam block that everything was encased in. It’s designed to carry the aircraft around and keep it safe, but you do need to remove the rotors and antenna before it can fit back in the box. The package itself is also very small for such a large racer; you could easily fit it inside a backpack and still have room for your transmitter and FPV screen. The only thing missing from the box was a set of instructions! We were lucky enough to get an early version of the Eachine Racer 250 and apparently, the instructions weren’t finished yet, which meant that we had to figure everything out by looking online. It wasn’t too hard to figure out, because the people who produce the aircraft have posted a very simple set of instructions online for anyone getting started with this racer. The racer comes with a small carbon fiber wrench for removing and installing the rotors, but you will need your own 2.0-size hex wrench to install the receiver. You will also need a computer and an old-school mini USB cable so that you can plug in and program the flight controller. You’ll also need to supply your own transmitter and receiver. The aircraft comes with a CC3D flight controller, and I suggest using the FlySky FS I6 transmitter and receiver. They are pre-bound at the factory and sell for about $50 as a package deal. It’s a decent transmitter and receiver package at a good price. If you want to use your own transmitter, you might need a different receiver. Installing the receiver and programming the aircraft took about 2 hours total, including testing. You have to start by removing the top carbon fiber plate, held on by a total of ten screws, and you also need to unplug the power cord connecting the camera to the main board. Don’t pull too hard on it or you can break it; try to unplug it before you take out the screws. Once you get the top plate off, you can plug the wires into the receiver and stick it in the aircraft. The wires go as follows. The Red-Black-White wire goes on Channel 1 and the black wire connects to the outer pin. Don’t plug that in backwards or you can damage the receiver. The blue wire goes on Channel 2, the first yellow wire goes on Channel 3, the bluish-green wire goes on Channel 4, the second yellow wire goes on Channel 5 and the black wire goes on Channel 6. The single wire of each plug goes on the innermost pin of each channel plug. Once you have them all plugged in, you want to stick it in the aircraft with the plugs facing down; it will only fit one way. After you’ve installed the receiver, you can put the spacers and top plate back on. You also have to put the camera back in while you’re attaching the top plate, which can be a little tricky. Once you have it back together, DON’T TRY TO FLY IT YET! You still need to program the flight controller. You can power it up to make sure that everything works, but don’t put on the rotors yet. If you do, the racer will just flip over and crash without flight programming. Download Open Pilot GCS and install it to your computer. If you have an older computer, you’ll want to click the check box to install the mesa open GL drivers to make it work on your computer. Don’t plug the battery in until it tells you to do so. Once the program is installed, it will ask you to connect your aircraft to the computer with a USB cable. The USB plug on the aircraft is a bit hard to access, but not too difficult. Once you plug the USB cable into the aircraft, Open Pilot GCS should recognize it. Then, you can simply follow the prompts to program the flight controller. The first thing you usually have to do is update the flight controller firmware, and I personally had no issues updating the firmware. Next, you tell it how many rotors the aircraft has, what the layout is, what type of speed controllers it uses, and how much power to send to the motors at the lowest speed. You also calibrate the gyro during this process, but remember, before you calibrate the gyro, make sure that it’s sitting on a completely level surface. After you finish programming the flight controller, you will save the settings to the aircraft. Then, you need to configure the transmitter layout and make sure that all the transmitter sticks work the way you want them to. When I was setting up my Racer, I went with a very generic setup that was quick and easy, but if you want to go deeper into the settings, you can program it to behave however you want – aggressive, stable, or somewhere in between. Because there were no instructions, I went with the Open Pilot GCS standard quad rotor configuration. There is a PDF instruction manual that you can download for the Eachine Racer 250, but it contains no information on how to install your receiver or program the flight controller. It’s more of a set of instructions for the RTF version, which isn’t available yet. My first flight was great. I lifted off the ground and took control of the aircraft without any problems, and I found it to be very stable, responsive and powerful. It did exactly what I told it to do when I told it to do it. I felt a sense of relief and accomplishment when I took my first flight and found that everything worked. The only thing I had to adjust was the cameras focus, which was relatively easy to do, but it did require removing the camera and unscrewing the ring behind the lens so that I could screw the lens into focus. With a little caution, it’s easy to do, but be careful when you unplug the camera’s power cable. When I unplugged mine, the plug disconnected from the main board and had to be re-soldered. It was a pretty easy fix, but still a bit frustrating. This is an aircraft capable of both day and night flying, and the camera is equipped with an HD night system, meaning that you can always see what’s in front of you, no matter how dark it is. Also, the bright headlights are visible from hundreds of yards away, so orientation isn’t a problem. This racer also has enough power to handle some pretty intense wind, so you don’t need to worry about the weather, as long as it doesn’t rain! 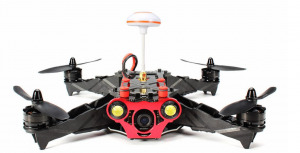 There are 2 flight modes available with the standard setup: normal and professional. The normal flight mode is what most people are familiar with; when you let off the stick, the aircraft will stabilize itself and the rates are limited. In professional mode, the rates are exponential, so if you keep pushing forward on the stick, the aircraft will continue leaning forward, and the racer won’t auto-stabilize when you let go of the sticks. In professional mode, you can do tricks and stunts, but you need a decent amount of skill to be able to pull them off. Professional mode allows you to go faster, but you need to be paying complete attention and maintain control throughout the whole flight. I suggest trying normal mode until you’re confident you won’t crash, and definitely if you’re going to be flying FPV. This is an aircraft designed for racers on a budget – people who like to fly fast and hard, but who don’t want to spend a lot of money every time they crash. Unfortunately, it’s an online aircraft, so getting spare parts means waiting on the mailman. You won’t be able to bring this racer into your local hobby shop and buy replacement rotor arms; you’ll have to find them online. At the moment, the spare body parts list is pretty limited, but in the future, there will be more spares offered. However, as of now, take this limitation into consideration before you fly too wild and crash. This racer doesn’t have any pre-programmed stunts (like the standard push button flip, which is so popular these days), and there is no onboard GPS system or any sort of barometer for altitude measurements. Therefore, it can’t do waypoint navigation and it has no “return home” feature. It’s strictly a racer, and when the voltage gets low, it lands. This can happen pretty quickly, so keep an eye on your battery. It gets great range and the built-in 5.8 GHz video transmitter does a good job at keeping a video signal streaming to your monitor. I was able to fly more then 200 yards away without any issues and I always had complete control. I attached the receiver wires to each of the rear rotor arms and tucked them out of the way, which seems to be a good setup. The ARF version, which sells for about $150, doesn’t come with a transmitter or receiver, but there is a version coming out that includes a pre-bound transmitter. However, if you look at the pictures of the new transmitter, you can see that it’s just a Flysky FS-16 transmitter that’s been rebranded as an Eachine transmitter and receiver. You might as well just go ahead and get the ARF version and buy the FS-I6. It uses an automatic search frequency and snowflakes with the standard OSD data, such as battery voltage, flight time and channel. There is also a button to turn on the OSD and shift its position on your display. I had no trouble viewing the video stream or the OSD data with my RX-LCD5802 monitor, but I wasn’t able to try it with any FPV glasses, because I don’t own any. Also, if you’re going to fly FPV, you really need a set of FPV glasses. If you’re going to try to fly by looking at a seven-inch screen, then you’re going to have some trouble. Most quad racers that I know say they can only fly FPV with glasses, and even then, it’s a skill that takes practice. The camera is definitely the nicest onboard FPV camera that I’ve ever used. It has a great wide angle lens that gives you an impressive field of view and it’s capable of seeing in the dark with built-in HD night flight capabilities. You can see a few hundred feet ahead of yourself at night and during the day, which is something many racers don’t offer. It uses a 1000 TVL HD camera, but on my display, it just looks like normal 720P video. It wasn’t super crisp 1080P high-quality video, but it will work perfectly for racing FPV. Furthermore, it’s actually a very stable image with no rolling shutter or jiggling. It’s a very minimalist camera – essentially a circuit board with a nice lens attached to it, without a case or any unnecessary parts to weigh things down. You can reposition the camera if you wish, but you need to loosen a few screws to do so. The camera is basically sandwiched between the top and bottom carbon fiber body plates, so you can loosen them and move the camera, and then retighten them to hold it in place. This gives you the ability to tilt the camera down for racing or keep it pointing straight ahead. If you want to film your flight, you’ll need a second camera, because the included 5.8 GHz FPV camera does not have an SD card slot or the ability to record video. It is strictly for FPV flying. If you want to record the video stream, you’ll also be recording any static in the video. Fortunately, the Eachine Racer 250 comes with a shock-absorbing plate on the top of the aircraft to which you can easily attach a camera. The design is basically 4 silicone pads with a carbon fiber plate on top, where you can tape your GoPro or similar-sized camera. I used a piece of 3M double-sided foam and it stayed on securely through the whole flight. I was very impressed with how stable the video was when I attached the external camera to the platform. It did a great job removing vibrations and it had a good field of view. I found the whole FPV system to be very easy to use. My video monitor found the video stream very quickly and after I realized that I had to take the lens cap off the camera, I was able to see exactly what the aircraft was seeing. 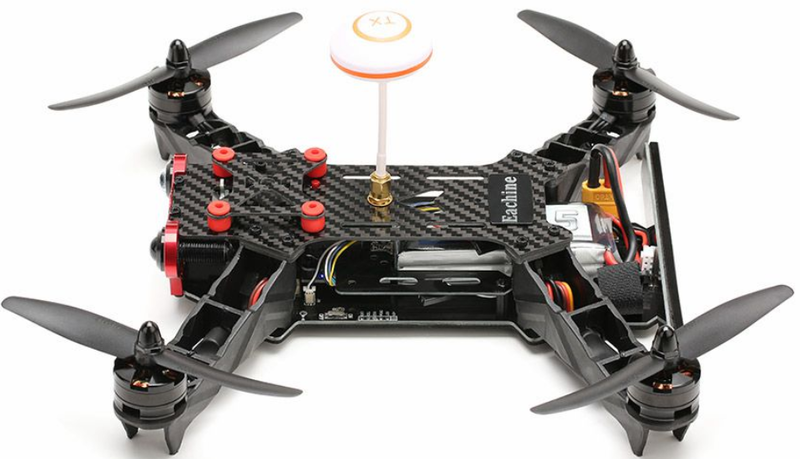 If you’re interested in quad rotor racing, then this is a good starter aircraft for you. It will teach you that you are not alone in this sport. It will teach you the basics of how to program an aircraft and will show you that there’s a large community of people out there that can help you get started. I quickly learned that I shouldn’t be intimidated about programming my aircraft once I installed Open Pilot GCS on my computer and discovered how user-friendly the program is. The Eachine Racer 250 is fast, durable, easy to service and crash-friendly, so it’s a good racer for anyone. 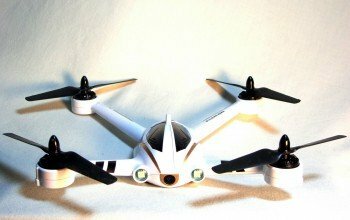 Like all quad rotors, it does take skill and practice to fly, so if you’ve never flown anything before, it might be a good idea to buy a cheaper $15 training quad to practice with before you go to the local races. FPV racing is a real skill and takes a good deal of practice, but once you get the hang of it, I think you’ll love the Eachine Racer 250.